Is Theatrhythm a Miserable Medley or a Musical Masterpiece? The Final Fantasy series as a whole has the best original soundtrack in gaming. While many series have a standout song or two, Final Fantasy has thirteen games—and many spin-off titles—brimming with instantly recognizable tunes. Whether written by Nobuo Uematsu, Masashi Hamauzu, or other composers, these memorable scores have captured the souls of gamers for the past 25 years. But even supported by a strong soundtrack, does the 3DS game Theatrhythm Final Fantasy have what it takes to stand on its own against the titans of the music game genre? Good — Now THAT'S a Soundtrack! The amount and variety of music in Theatrhythm is stunning. Right out of the box, it has 65 songs available—five from each Final Fantasy. These songs range from character and battle themes to each game's intro and ending. As you progress, another twelve songs can be unlocked—not to mention the additional 50 songs planned for release as DLC in the months after the game's launch. So it's a safe bet that while all your favorites may not be available right now, they will be in the near future. fantasy characters. 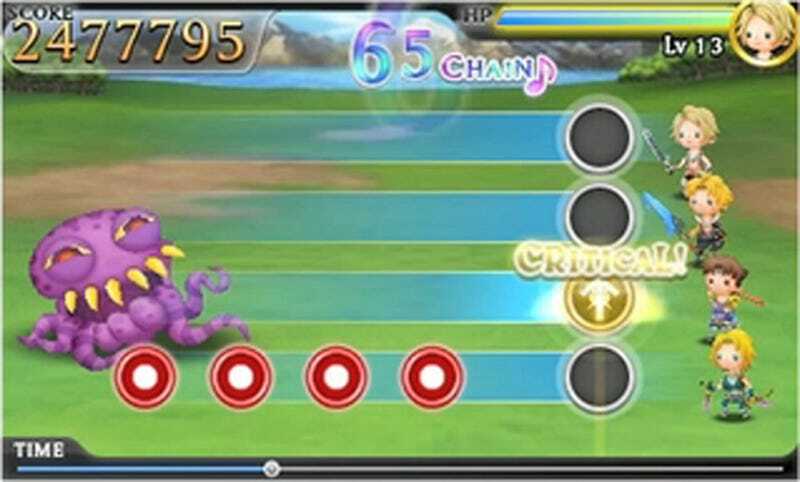 As you play, they level up and learn spells and skills to help you with each song's harder difficulties. These can be anything from healing spells that restore the damage you take from missing notes to stat increases that help you find items more often. The way the songs are presented also take a cue from the RPG Final Fantasies by mimicking turn-based battles, travel on the world map, and full-motion video cutscenes. All these come together to add an extra layer to the game by giving you additional goals to focus on other than just passing the next song. Mixed — The "C" Also Stands For "Costly"
The DLC for Theatrhythm is a double-edged sword if there ever was one. While it does add great songs to an already meaty song list, each song costs ¥150 ($1.80). And with 50 DLC songs planned, anyone wanting the complete collection will find themselves paying an additional $90—far more than the price of the game itself. To be fair, though, on a song-for-song basis, this is no more or less expensive than the DLC from other music games. on the screen, you must flick your stylus in the same direction the arrow is pointing. While those with some talent in drawing may have no problems with these arrows, I found that despite flicking in the correct direction, my aim was simply not exact enough to count as a hit. Moreover, if you (like me) hold your stylus like a pencil, you will find some of the diagonal arrows (upper left and bottom right) more than a little uncomfortable to perform. Simply put, despite your skill at music games, Theatrhythm may demand drawing precision you just don't have. Twenty-six of the songs included in Theatrhythm are intro and ending song stages. In these, you simply tap along with the melody. There are no hold arrows or flick notes. There is no winning and no losing. You just tap and nothing else. And each time you tap, you get a horrible off key sound effect that clashes with each and every song—practically ruining them. Worse yet, these songs do not have any different difficulty levels and cannot be played individually—you have to play them as part of a playlist. So those of you wanting to play "Eyes on Me" will have to play three other FFVIII tracks every time you want to tap along with it. Theatrhythm Final Fantasy is a game aimed at one specific market: people who love Final Fantasy music. If you count yourself among this group, you will definitely want to pick up this game. With its soundtrack and RPG elements, you will enjoy every moment—and will be able to overlook its shortcomings. But if you are simply a fan of music games with no love of the source material, you'll find this little more than a short diversion while you wait for your next big fix.